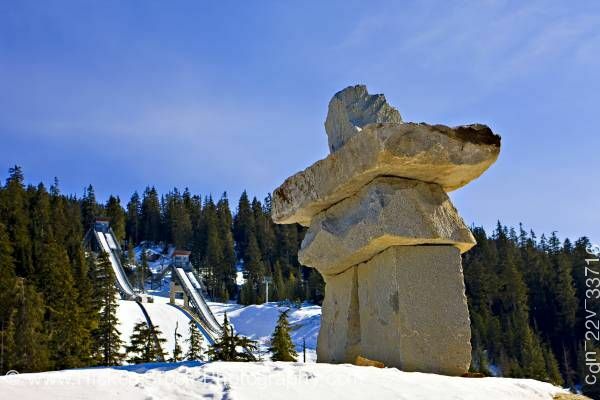 This stock photo includes a large stone inukshuk - Ilanaaq (the Vancouver 2010 Olympic Winter Games emblem) at the entrance to the Whistler Olympic Park Nordic Sports Venue, with the Olympic Ski Jumps in the background, Callaghan Valley, British Columbia, Canada. The Callaghan Valley is a wilderness recreation area in the Sea to Sky Country of southwestern, British Columbia, located in the Pacific Ranges of the Coast Mountains 90 km 1 north of Vancouver. An inukshuk is a man-made stone landmark or cairn, used by the Inuit, Inupiat, Kalaallit, Yupik, and other peoples of the Arctic region of North America, from Alaska to Greenland. This region, above the Arctic Circle, is dominated by the tundra biome, containing areas with few natural landmarks.